Galaxy winner Nature Strip had four previous trainers before ending up with Chris Waller. 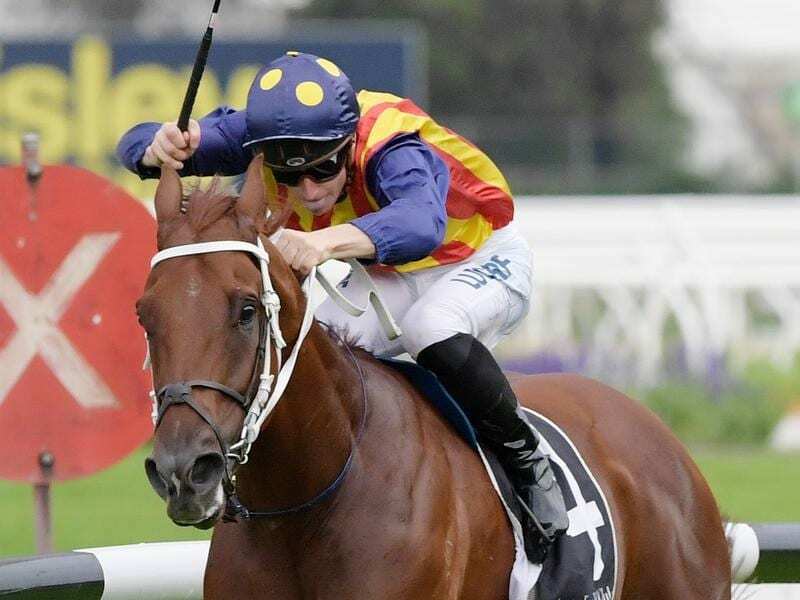 By the barest of margins, Nature Strip has delivered on his Group One sprinting potential to win The Galaxy at Rosehill over the fast-finishing Pierata. As $4.20 favourite Nature Strip was starting to feel the pinch late in Saturday’s 1100m sprint on a heavy track after leading and kicking clear in the straight, the Greg Hickman-trained Pierata ($10) was charging home out wide only to be denied by nose. Easy Eddie ($16) led home the rest of the chasers, another 1-1/4-lengths away. Nature Strip’s victory brought up a winning Group One treble for trainer Chris Waller on the Golden Slipper program featuring five Group Ones. The Autumn Sun had earlier won the Rosehill Guineas and headline act Winx easily won the George Ryder Stakes to stretch her winning sequence to 32. “It’s pretty good isn’t it, especially when one of them is Winx,” Waller said. Nature Strip has only been with Waller for three races, having previously had starts for Robert Smerdon, Robert Hickmott, John Sadler and more recently Darren Weir before Weir was disqualified early last month. Nature Strip was overrun after leading in the Group One Oakleigh Plate at Caulfield last start but that was not the case this time as he took his overall record to 10 wins from 15 starts. “Full credit to the teams, where he’s come from and where he is now, everyone’s had a go at training him,” Waller said. “I probably get the accolade for winning the Group One with him but there’s been a lot of hard work go into him through the years, so well done to all those trainers as well. “Great work by jockey James McDonald. He’s put a lot of time into the horse at home, on the training tracks and in his trials. And he’s just won. “He’s a lovely horse to train. We just have to get into his head on race day that the winning post is not at the 300 metre mark. For connections of Pierata, the defeat was hard to swallow but they were gracious in defeat. “I thought we were home,” Hickman said. “It’s a bit hard to handle. The horse got back and ran out of his skin. He hit the line really strong and there was only a cigarette paper in the finish. It was a great effort by our horse.